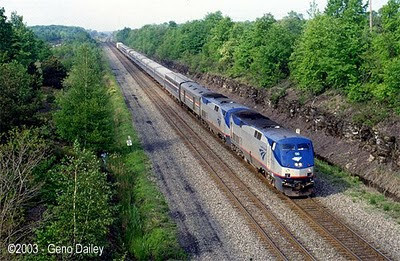 I'm on Amtrak heading from Baltimore back to NYC. I love riding trains. Where I live in Southern California train travel is a rarity. When I lived in San Diego I used to take Amtrak periodically from San Diego to LA for business. There is nothing more civilized than train travel. I know commuters who do it frequently travel via train might think differently. But try commuting for hours in a car....you're so limited in how you can utilize your time. You certainly couldn't blog like I'm doing now.....at least until they've eliminated the need for fingers for computers and replace it with voice commands. But I love to travel by train. By plane, in fact. And by boat. I guess I'm not very earthbound. I'd rather be going to, traveling to something and I'd imagine that is the appeal that boats, planes and trains have for me. I get to ride the train so infrequently these days that it is a true pleasure to do so. After dinner tonight, I'll head out to my deahest friend, Shelly Mullen's home in Long Island for a long weekend which I am eagerly looking forward to. It's a hassle (I live in Palm Springs and have to drive to San Bernadino or Riverside) but have u used Metrolink? U can travel just about anywhere in So Cal(fun trip to Claremont...u can go to Fullerton via Riverside and get Amtrak to San Diego) Cheaper than driving!